Cape Town - What happened in Vancouver, should stay in Vancouver. That is how Springbok Sevens coach Neil Powell feels on the eve of the Hong Kong Sevens. The Blitzboks completed their training for the tournament on Thursday and bar a quick captain’s run a couple of hours before their opener on Friday against Japan (kick-off at 12:06 SA time), Powell was pleased with the week’s preparations. "There are a couple of changes and a total of four new players from the Vancouver tournament and that considered, I am happy with the way things went," said Powell. 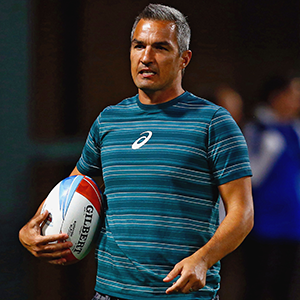 Powell stressed the fact that the team will start with a clean slate, despite winning in Vancouver last month, their first tournament victory in the World Rugby Sevens Series. "That win will not mean anything here in Hong Kong," said Powell. "It did help with the belief and was good reward for the work done up to that point. It gave the squad some momentum. We start afresh here in Hong Kong though and all focus will be on delivering a performance we can be proud of in our first match against Japan." "They need to understand their roles and responsibilities in the team, so we did focus a bit on that," explained Powell. "The most pleasing aspect about the win last time was the development of individual players into the team environment and the development of the team in executing our processes. If we can continue making progress in that regard I will be a happy coach." "It is now up to the senior players to use that energy and guide the guys in channelling it into the right direction. If we manage that, we will be good for this weekend," he said. "We played them in Las Vegas early last month and won 26-0, but they had us under pressure at times," said Powell. "They use the rush defence well and I see they have some guys from Pacific Islander origin that played for them in the past, back in the team." "We only play at six o’clock in the evening (Hong Kong time), so it becomes a long day waiting to get started. It is important to be switched on when the game kicks-off," he said. Meanwhile, Blitzboks midfielder Stedman Gans said he is keen to improve on his growing maturity as playmaker and leader in the team, with his status in the squad having changed from "asking the questions" to "providing the answers". "Yes, my role has changed a bit; the younger guys are now where I was a year or so ago, asking a lot of advice and looking for ways to improve. Now I find them coming to me for answers," Gans chuckled. "Time on the field gives you confidence and your impact on the ball gets better. The more you play the more you can anticipate and that gives you more time on the ball," he said, adding that he hopes to be a guiding light again this weekend, albeit in different circumstances. "Last year we were complete underdogs, this time we arrived here as the team who won the previous tournament (in Canada), and so the expectations will be different. For us though, it is all about starting from zero again and making sure we implement our processes."